(Nanowerk News) New York University Chemist Nadrian Seeman has been awarded the 2010 Kavli Prize in Nanoscience for his creation of robotic devices that have the potential to create new materials a billionth of a meter in size. The Kavli Prize is given every two years for "outstanding research and seminal advances" in astrophysics, nanoscience, and neuroscience. The laureates will each receive a scroll, a gold medal, and share of the $1,000,000 prize for each of the three fields. Seeman shares the nanoscience prize with Donald Eigler of IBM's Almaden Research Center. The Kavli Prize is a partnership of the Norwegian Academy of Science and Letters, the Kavli Foundation, and the Norwegian Ministry of Education and Research. For more on the Kavli Prize and a complete list of this year's Kavli Prize Laureates, click here. Seeman, the Margaret and Herman Sokol Professor of Chemistry at NYU, founded and developed the field of DNA nanotechnology—which is now pursued by laboratories across the globe—more than a quarter century ago. His creations allow him to arrange pieces and form specific molecules with some precision – similar to the way a robotic automobile factory can be told what kind of car to make. Seeman's work led the Christian Science Monitor to conclude that "nanotechnology may have found its Henry Ford." In the past year, Seeman's laboratory has made two significant breakthroughs in the field of nanoscience. The first is the creation of three-dimensional DNA structures, a scientific advance bridging the molecular world to the world where we live. To do this, Seeman and his colleagues created DNA crystals by making synthetic sequences of DNA that have the ability to self-assemble into a series of 3D triangle-like motifs. The creation of the crystals was dependent on putting "sticky ends"—small cohesive sequences on each end of the motif—that attach to other molecules and place them in a set order and orientation. The make-up of these sticky ends allows the motifs to attach to each other in a programmed fashion. A promising avenue for this work is in nanoelectronics, in which products are built from components no bigger than single molecules. Currently, these products are built with 2D components. Given the enhanced flexibility and density that 3D components would yield, manufacturers could build parts that are smaller and closer together as well as more sophisticated in design. The second is a DNA assembly line, created with colleagues at China's Nanjing University, which has the potential to build novel materials efficiently on the nanoscale. "An industrial assembly line includes a factory, workers, and a conveyor system," said Seeman. "We have emulated each of those features using DNA components." The assembly line relies on three DNA-based components. The first is DNA origami, a composition that uses a few hundred short DNA strands to direct a very long DNA strand to form structures to any desired shape. DNA origami serves as the assembly line's framework and also houses its track. The second are three DNA machines, or cassettes, that serve as programmable cargo-donating devices; they are attached to the origami in fixed positions. Changing the cassette's control sequences allows the researchers to enable or prevent the donation of the cargoes to the growing construct by altering the position of a nanoscale robot arm. The third is a DNA "walker," which is analogous to the chassis of a car being assembled. It moves along the assembly line's track, stopping at the DNA machines to collect and carry the DNA cargo components, which consist of distinct metallic nanoparticles. As the walker moves along the pathway prescribed by the origami tile track, it encounters sequentially the assembly line's three DNA devices. These devices can be switched between an "on" state, allowing its cargo to be transferred to the walker, and an "off" state, in which no transfer occurs. In this way, the DNA product at the end of the assembly line may include cargo picked up from one, two, or three of the DNA machines. Seeman was the founding president of the International Society for Nanoscale Science, Computation, and Engineering. He has received the American Chemical Society's Nichols Medal as well as the Sidhu Award from the Pittsburgh Diffraction Society, a Popular Science Magazine Science and Technology Award, the Feynman Prize in Nanotechnology, a Discover Magazine Emerging Technology Award, the Tulip Award in DNA-based computing, a Nanotech Briefs Nano50 Innovator Award, the World Technology Network Award in biotechnology, the Alexander Rich Medal from MIT, and the Frontiers of Science Award from the Society of Cosmetic Chemists. 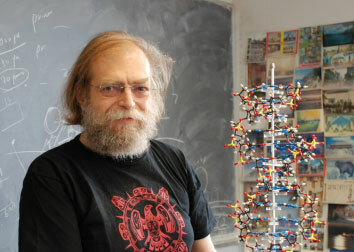 In April, he was awarded a Guggenheim Fellowship, under which he will write a textbook on structural DNA nanotechnology.